Have you ever called your phone or cable company and threatened to cancel, in hopes that they'd lower your rate? I hate paying a lot for cable, and recently they hiked up some of our fees. How do you get around those expensive bills? Cancel cable? One of my favorite finishes are polishes embedded with flakes, but unfortunately they're not easy to find. When I saw the finish the on Elevation Polish These Boots Were... I was compelled to order a bottle ASAP. For a non glitter polish, it's an incredibly complex looking compilation, beginning with a burgundy jelly base and finished with blue shimmer and tiny red flakes. The formula has a thin consistency but is easy to apply, with minimal pooling and no streaks. I used two smooth coats here and finished with a layer of topcoat. A polish like this always makes me melt a little inside. From afar it doesn't look too complicated but the visual beauty is much more appreciable up close, which is just the way I like it. It's a special little treat that only I get to see during the day. 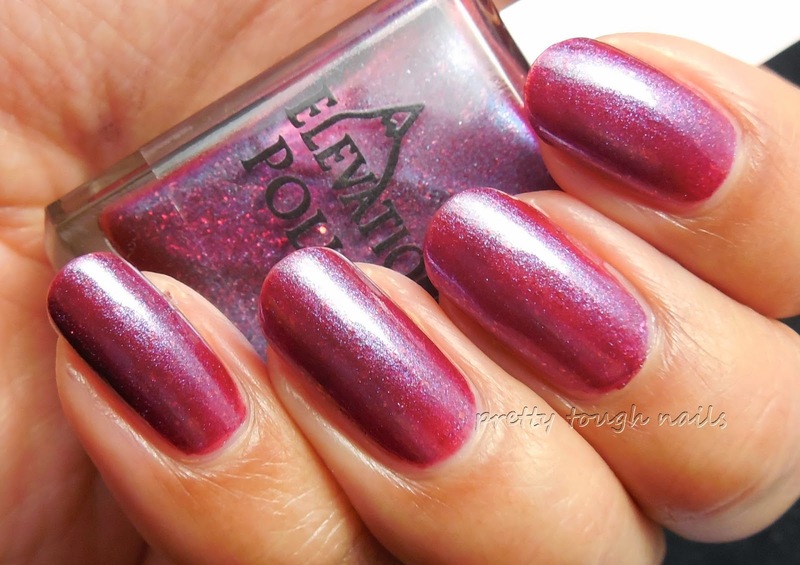 Elevation Polish always delivers when it comes to polishes like these, from beautiful creams and shimmers, to holos and well executed glitters. You can't go wrong with one! I'm glad that Lulu took the time to make a pretty microflake polish. Do you have a microlike that you love? Just gorgeous! And to think, this was the one in that collection I thought I could take a pass on. How wrong I was! Your pics are some of the best I've seen of it. Time to add to my screensaver slideshow collection!